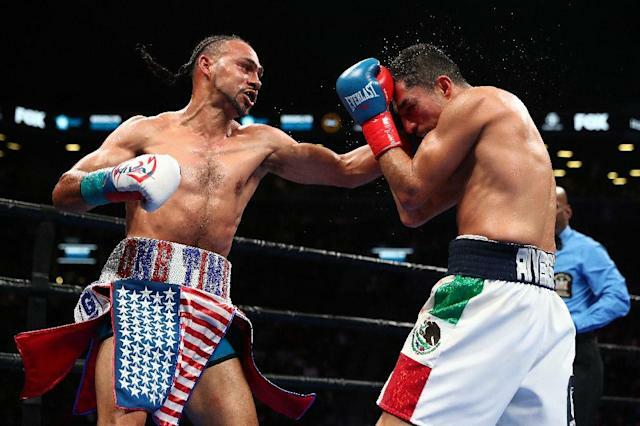 New York (AFP) - Keith Thurman returned from a near two-year layoff to retain his World Boxing Association welterweight world title with a 12-round majority decision over Josesito Lopez on Saturday. America's Thurman, showing no sign of rust, knocked down Lopez with a massive left hook to the chin in the second as he controlled the early rounds. He weathered a storm in the middle rounds, with Lopez unleashing a fierce barrage in the seventh that had the champion in trouble. Thurman was deemed the winner by two judges by scores off 115-111 and 117-109 with the third seeing it a 113-113 draw. "The champ is back!" said Thurman, who was forced to surrender his World Boxing Council belt as he was idled by injury but retained his WBA "super" world title, one rung above the "regular" WBA belt held by Manny Pacquiao. Thurman, who improved to 29-0 with 22 wins inside the distance, said he'd be ready to take on the Filipino ring icon before the year is out. 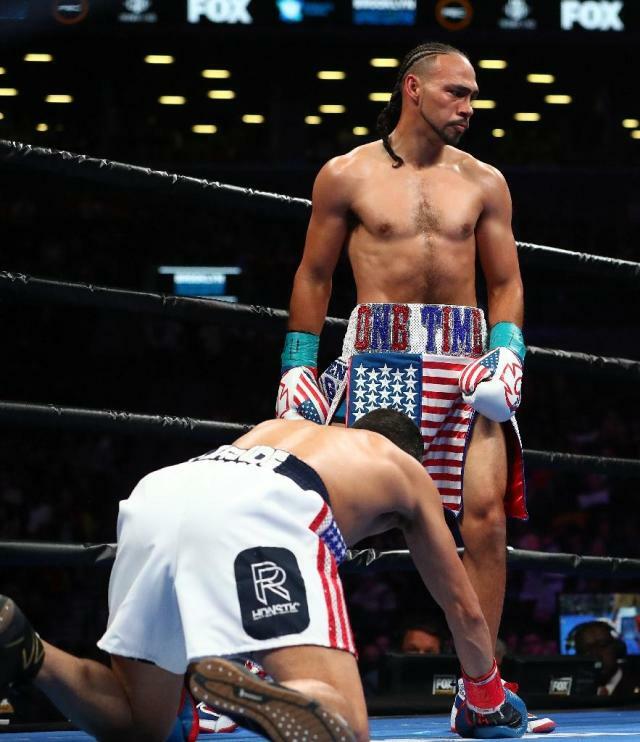 "Maybe Brooklyn, maybe Vegas, wherever Manny Pacquiao wants it," Thurman said. "I'd even fight him in the Philippines if I have to." Thurman was fighting for the first time since edging Danny Garcia by split decision in March of 2017 to unify two 147-pound titles. The next month he had surgery to remove calcium deposits from his right elbow, and as he was readying to return to the ring he suffered a left hand injury in March of 2018 that forced him to take more time off. Nevertheless, he quickly took control against Lopez, moving well against the aggressive challenger and landing solid punches. But Lopez had him on the run in the seventh, connecting with a huge left hook to Thurman's jaw and backing up the champion. "He had me buzzed, he had me shaken up," Thurman admitted. "I was trying to stay on the outside. I just was a little off in my prediction of his long arms and the way that he was lunging in, willing to really swing and commit for the knockout. He was coming for me." After another solid performance from Lopez in the eighth, Thurman regained control and said he'll only get better from here. "I told everybody, you're not going to see the best Keith "One-time" Thurman after 22 months, but you will see a world title performance." 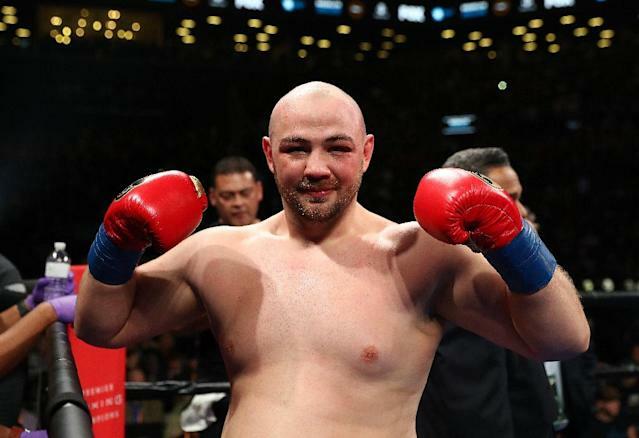 On the undercard, Polish-born, Brooklyn-based heavyweight Adam Kownacki remained unbeaten with a spectacular second-round technical knockout of former world title challenger Gerald Washington. Kownacki improved to 19-0 with 15 wins inside the distance. He sent Washington to the canvas with a massive right hand in the second round. Washington beat the count, but the referee called the halt moments later -- at 1:09 of the second round -- as he failed to put up any defense under a barrage from Kownacki. In a World Boxing Association featherweight eliminator, Mongolia's unbeaten Tugstsogt Nyambayar improved to 11-0 with nine knockouts with a unanimous 12-round decision over Claudio Marrero. Nyambayar won by scores of 114-113, 115-112 and 116-111 as Marrero, who had a point deducted for a low blow, fell to 23-3 with 17 wins inside the distance.